The 2018 Road Show has concluded. Stay tuned for details about our next Road Show in 2020. Be sure to browse our Road Show gallery (below) and read up on all the details of yet another fabulous Path Less Traveled event. Click on each photo to see highlights from these tours or talks. To learn more, please see the full Road Show Conference program. MPA Director, Chere Jiusto kicked off the start of the Road Show at Belton Chalet in West Glacier. We were delighted to have Flathead National Forest Supervisor, Chip Weber, on hand to welcome the Road Show to the Flathead and Glacier regions. Mr. Weber emphasized the importance of agencies and local organizations working together to promote and encourage heritage stewardship. Hal Stearns, historian, educator, and recipient of the 2017 Montana Governor’s Humanities Hero award started his talk with a bit of small town Montana trivia. 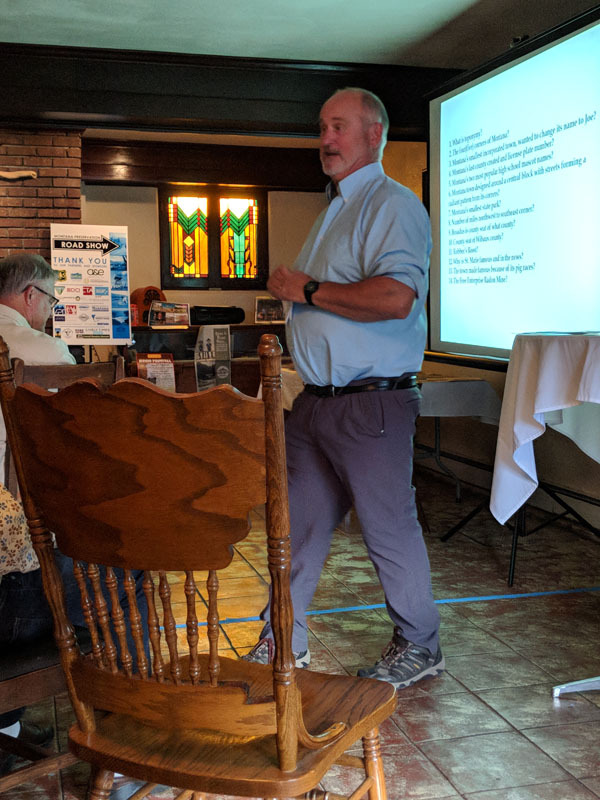 Mr. Stearn’s talk was chock-full of colorful, clever, and intriguing data on the significant role that Montana’s small towns played and still play in making the state a vibrant and viable place to live. 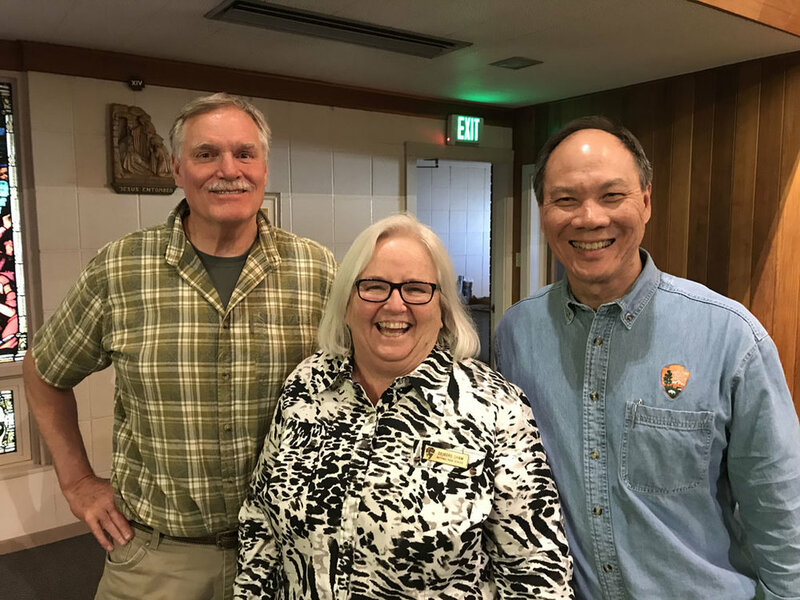 Left to right: Tom Beaudette, DCI Engineers; Deirdre Shaw, Glacier National Park Museum Curator; Jeff Mow, Glacier National Park Superintendent gave an engaging and hopeful talk highlighting the past, present, and future of the beloved Sperry Chalet in Glacier National Park. Our keynote talk on the History and Future of Sperry Chalet was a fascinating look at this stately stone chalet’s significance to the park and park visitors. Glacier Park Museum Curator Deirdre Shaw started the talk with a wonderful slideshow of historic photographs describing the chalet’s construction and use from 1910 to 2017. Tom Beaudette of DCI Engineers was flown by helicopter to assess the condition of Sperry Chalet just weeks after it burned. He was surprised and elated to find the walls and mortar in good condition. Just a month later, Glacier Park Conservancy had raised funds to stabilize the walls, and another month later, the stone structure was on it’s route to a new future. Jeff Mow, Glacier National Park Superintendent, detailed the public process to plan the course for Sperry Chalet, and highlighted the public’s hopes and dreams for the future of Sperry Chalet. MPA Director Chere Jiusto (right) with Liz Hallas, whose firm Anderson Hallas is the architect handling restoration of Sperry Chalet. Anderson Hallas was also a sponsor of our evening talk. MPA in partnership with the USDA Forest Service Region 1 put on another fabulous and informative Montana Preservation Road Show, June 13-16, 2018 at Cedar Creek Lodge in Columbia Falls and around the Flathead/Glacier region. 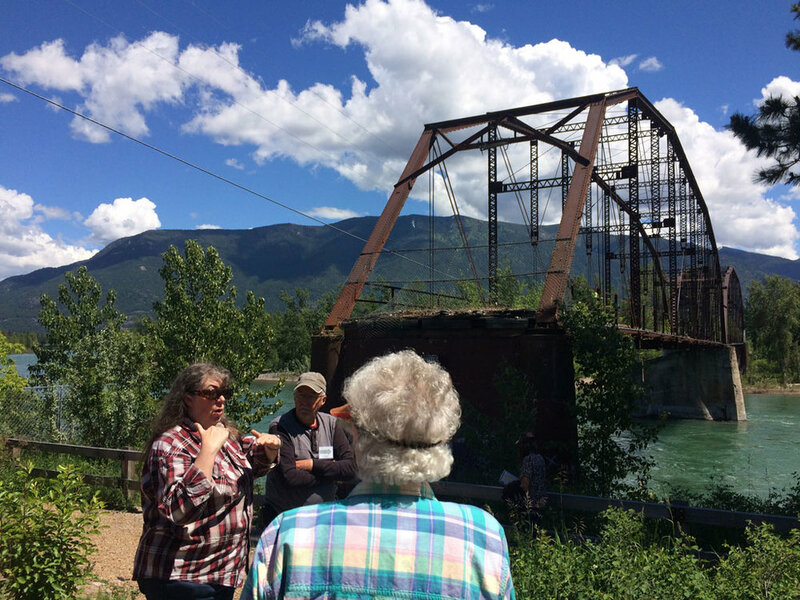 Over 80 participants were immersed in the history, heritage, and culture of the region learning about everything from fire lookout towers, ice patch archaeology, regional writers, and backcountry heritage, to local development history, agriculture and homesteading, tribal heritage and culture, midcentury industrial architecture, forest service and recreation history on the north and south forks of the Flathead River, railroad architecture from Kalispell to Glacier National Park, and much more. All along the way, veteran preservationists, local historians, tribal experts, archaeologists, teachers and professors all joined in to provide a well-rounded portrait of the historic places that define the Flathead area and her people. We have so many people to thank for their contributions to making the Road Show possible, but first and foremost we thank the USDA Forest Service's Heritage Stewardship Enhancement program, the National Endowment for the Humanities, Montana State Parks, and A & E Architects for their generous support. Many other businesses, scholars, historians, writers, and preservationists gave support or provided invaluable information and tour assistance along the way. As you browse our galleries, you'll see how the Road Show brings together a whole alliance of people, organizations, agencies, and businesses, all working to save and protect historic places. Maybe you missed the 2018 Road Show, but you can still check it out online. Just browse the gallery below. Thanks again to our many partners and sponsors! !